Roasting is my new favorite way of cooking vegetables. 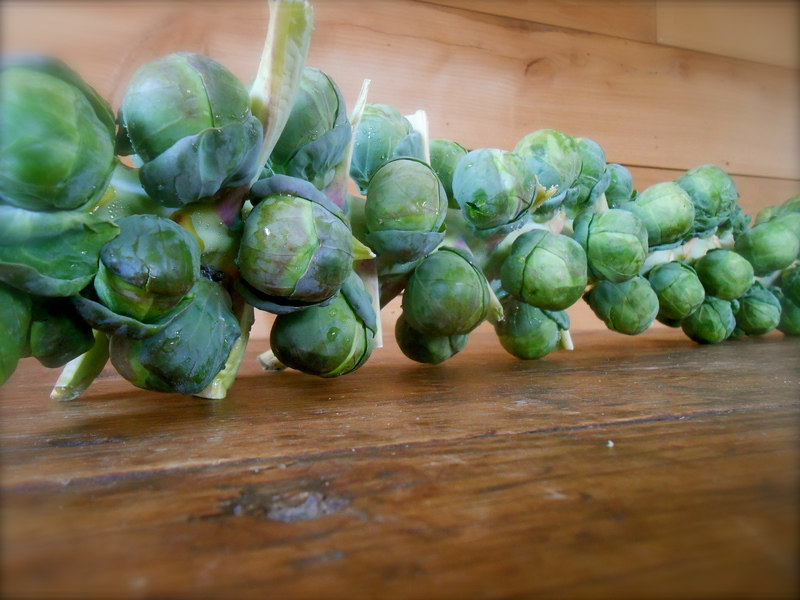 We roasted brussels sprouts the other day and they were a showstopper. I think this is an excellent idea as a T h a n k s g i v i n g side dish. It takes 30 minutes of (almost) hands free cooking. No need to have a spatula in your hand while trying to mash the potatoes. We all know timing in the last 30 minutes is crucial when cooking Thanksgiving dinner. The turkey comes out of the oven and suddenly a state of pandemonium ensues. The buns go into the oven, potatoes are mashed, the gravy requires your undivided attention, and don’t forget the vegetables! This can be very challenging. Simply slice the brussels sprouts in half, toss in salted olive oil, spread them out on a parchment lined cooking sheet and set aside until the turkey is removed from the oven. Place in a 400°F oven for 30 minutes. Give them a good toss every 10 minutes. Roasting them alone is wonderful or add diced bacon, whole garlic cloves and chopped walnuts before placing in the oven. This is sure to be a crowd pleaser. Great recipe to make this vegetable taste good. You won’t believe this but sprinkling the halved sprouts with caraway seeds before you put them in the oven to roast is a DELICIOUS addition. I’ve never actually seen brussels sprouts still attached to the stalk. How absolutely gorgeous! Love roasted sprouts and with bacon tossed in, it’s the only way I can tempt my boys to eat them (everything tastes better with bacon, according to them, and me just secretly)… Happy Thanksgiving. Looking forward to the Thanksgiving posts from your side of the world next week! Those spreads always look amazing. Oooo. I imagine chestnuts would be fabulous roasted with brussels sprouts. How do you buy your chestnuts? We have loads of chestnut trees around here so we go and pick them up off the ground! The only pain is shelling them – but they’re worth the effort – I love them! These are beautiful. I love brussels sprouts and I”m so glad they’re making a comeback in popular cooking. Wonderful recipe. Great to see a Brussels sprout recipe. Looks delicious. Its no secret I adore them. My favourite winter vegetable.. Not having Thanksgiving over here we do roast turkey with all the trimmings for Christmas. Delicious! Like you I loathed Brussels sprouts as a child, but love them now. I must try roasting them! I did this for our Canadian Thanksgiving and they were delish! After they came out of the oven I drizzled a reduced balsamic vinegar glaze over them… yum! I love your recipes. I am always so inspired to cook up what was on your blog that day. Hi, Seana. There is nothing better than roasted Brussels sprouts as a Thanksgiving side-dish! Oh, and your photos, particularly of the deep green, circular sprouts on the stalk, are just beautiful. I like your idea of pairing the sprouts with salty bacon or crunchy walnuts. If you added small-diced bacon or halved walnuts in the last ten minutes of cooking time, they would roast perfectly. Thank you for sharing – and have a great weekend! Warmly, Shanna. I love roasted brussel sprouts!! We roast them with butternut squash and parsnips for a perfectly fall Thanksgiving side dish! Did you grow these? Love how the look on a branch. And, no…I didn’t grow these. The markets have been presenting them like this for a few years now. It is a fun way to buy them, although it is another step in preparation…you have to break them off of the stem first! We just had roasted brussel sprouts tonight — they are one of our favorite sides. Just wonderful…I bought some brussels only yesterday and was wondering what I would do with them for a change. Totally agree, roasting vegetables is the best. I love roasting brussels sprouts, they are wonderful and I love your idea of adding bacon and walnuts. Sounds great! It is just unfortunate for me that no one in my family likes brussel sprouts — I like them even done ‘plain’, steamed with a little butter. But I can imagine how wonderful they must taste in your roasted version! I think I am just going to have to cook some brussel sprouts like this just for myself! Bullseye! Beautiful. Can taste them from here. I love your idea of a big bowl (especially pottery) full of roasted vegetables, especially baby onions! I’m going to serve them like this next time. Sounds so lovely. Love roasted Brussels Sprouts — my favorite way to have them! Roasting the sprouts makes all the difference, I agree here! Yum Yum Yum. I was in Brussels the day you posted this recipe :-) A great honour to Brussels sprouts your recipe! Must be delicious with walnuts, I tried them with some Chorizo but will add walnuts for sure! I hate to admit that I never ate a brussel until last year! Now I just love them and can’t believe I had never tried them before. These look delicious and I love some of the additions here like the chestnuts, bacon, etc! My favorite. Always and always. 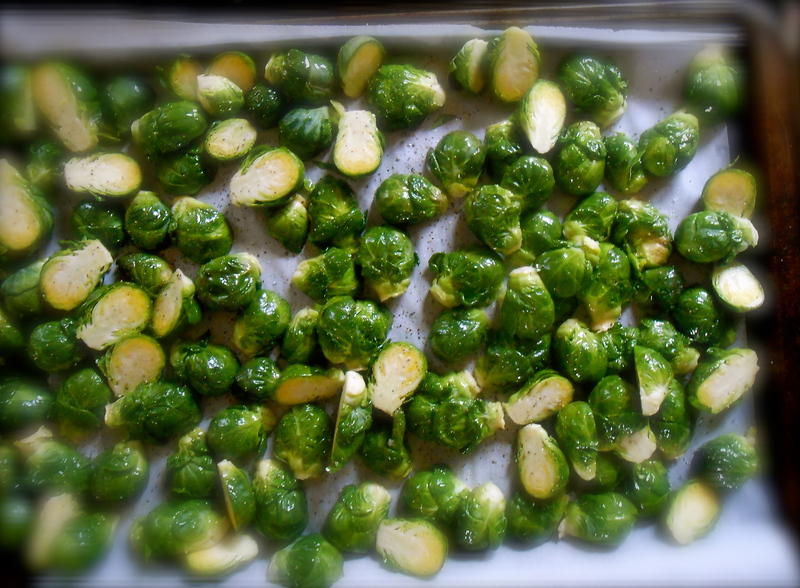 You are currently reading roasted brussels sprouts at COTTAGE GROVE HOUSE.